Encouragement speaker Derrick Hayes gives an AUTISM interview by asking six questions through each letter in the word “autism” to give readers an insightful perspective from parents, experts, entrepreneurs, and other leaders in the field. 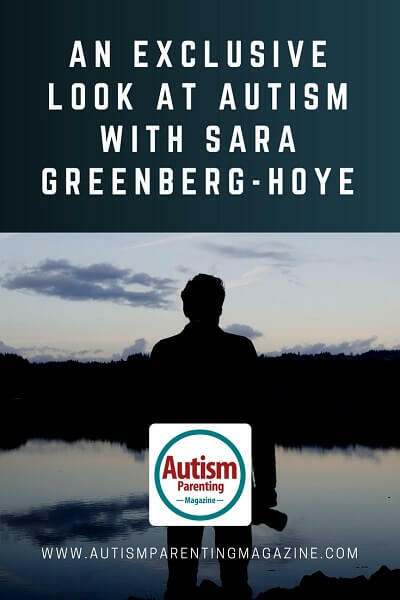 Today’s AUTISM Interview is with Sara Greenberg-Hoye who is the mother of seven children, from ages 8 (Harry) to 30, in a blended family. She is the director of development at Greystone Programs, Inc., a human services agency dedicated to supporting children, adults, and families living with autism and other developmental disabilities. She is currently spearheading Greystone’s 2nd Annual Leap for Autism skydiving fundraising event, for which information can be found at www.gvgb.co/leapforautism. Sara will be throwing herself out of an airplane to raise awareness and funds for autism. A mother knows. I was acutely aware of my son Harry’s differences clearly by the time he turned three. I have two much older typical children. Harry’s behaviors were anything but typical. You just know. Each child on the spectrum is unique. No two are the same. It’s a journey and a huge responsibility to interpret for your child and to advocate for him. Because Harry can present so typically when you first meet him, I feel like I’m the only one who truly understands him. I can see when things are misfiring in Harry’s mind before others notice anything different. We are intuitively connected. It literally takes a village. Literally. I resigned from my former development position and made Harry my job for a year to find all of the tools and supports he requires: specialists and therapists, testing, evaluations, documentation, Individualized Education Program (IEP), childcare support, summer camp placement, school meetings, school meetings and more school meetings. It’s a fulltime education—a never-ending doctorate in autism spectrum disorder. I is for Inspire – As a parent, when you look at your child or children what inspires you? Harry has a beautiful mind—he’s actually brilliant. He thinks differently than you or me. I’m inspired by his creativity, intuition, and intellect. I’m inspired by how hard he tries to respond appropriately. It’s a dance that we do together—sometimes when I’m all feet, he’s perfectly graceful. It’s stressful being the parent of a special needs child. Support? We have a lot of support for Harry now. However, as Harry’s main source of support, I must remember to take care of myself. I’m so much more than “Harry’s mother.” At this point, the best support for the both of us is brief time spent apart, so Harry can learn to do life in moments without me and I can remember who I am at my core. For me, maybe it’s just to grab a cup of coffee with a friend or grab a fist full of tulips and to window shop, to read a good book or to have a good cry. When we come back together, we’re both energized and accomplished. How do I manage? I get up disgustingly early every morning and spend time in solitude. I pray for the wisdom and strength to measure each and every word shared with Harry; to be his greatest encourager; for increased patience; for faith. Also, while my calendar fills and fills and could easily become overwhelming, I look only to each day knowing that I haven’t been given more than I can handle. To whom much is given, much is expected. Because every special needs parent is a super hero. Seriously. Derrick Hayes is an author, motivational speaker, and paraprofessional with students with autism in the Muscogee County School District in Columbus, Georgia. For contact or booking information, please visit his website, email or call him.